Every year, a European city is chosen to become the global centre of Beauty. This year’s In-Cosmetics was held in Amsterdam, the capital of the Netherlands, from April 17 to 19. “In-Cosmetics Global” is the most important trade exhibition for suppliers, distributors, and customers of cosmetic ingredients. KLK OLEO group companies are very well regarded in the market, our ingredients can be found in many products, from hair dye products to bubble baths, and from mild soap for sensitive skin to luxury make-up. Prior to and during the show, there was much excitement around the trend of nutricosmetics and we took the opportunity to promote our DavosLife E3 Tocotrienols which falls into this category. The preparation for this event was certainly a global affair, involving colleagues from Malaysia, Germany, Belgium, the Netherlands, UK, and Switzerland, using different communication channels, including webinar sessions. The theme for this year’s In-Cosmetics was “Beautify your life”. While beauty lies in the eyes of the beholder, there is no denying that beauty invokes spontaneous positive feelings. And in KLK OLEO, we manufacture high quality ingredients that are used in cosmetic products which accompany us throughout the day. Because our products are so closely associated with personal care, we are strongly committed to supplying the best. Our business strategies and operations are deeply rooted in sustainability. 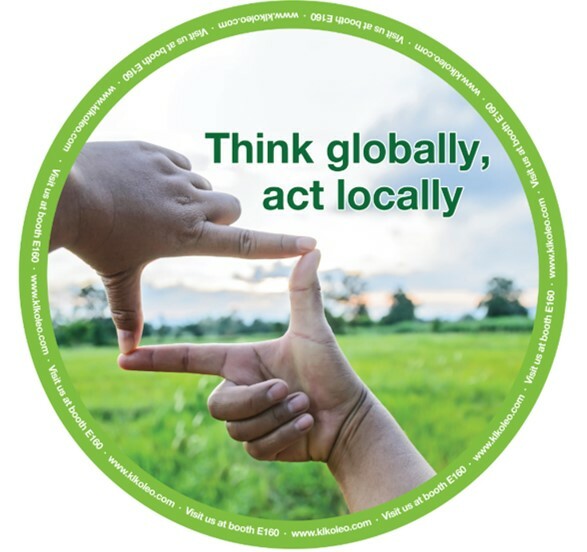 As a major resource-based manufacturer, it is all the more important for us to embrace sustainability in every aspect of our business processes as we are dealing directly with natural raw materials and vast resources. This year, we showcased KLK OLEO’s serious commitment towards Sustainability. 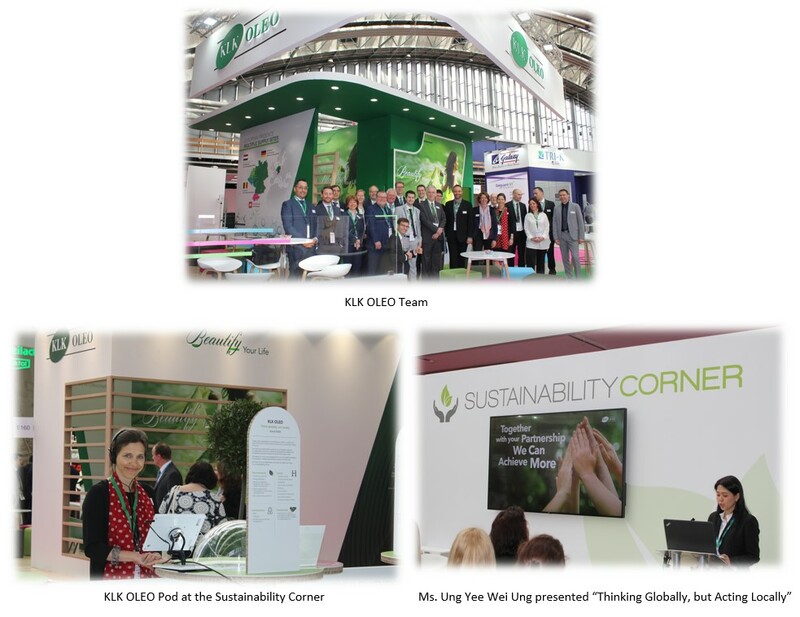 Visitors at the Sustainability Corner had the opportunity to hear Ms. Ung Yee Wei, our KLK OLEO Technical Director, speak on how KLK OLEO has successfully incorporated the concept of Sustainability within our Supply Chain. Ms. Ung walked the audience through KLK OLEO’s progress in Sustainable Supply Chain Management, and shared how through a structured third party Supply Chain Management Program, and a Risk-based Sustainability Sourcing Framework, we have made good progress reaching out to various stakeholders. For the financial year 2017, based on desktop tracing, we have successfully trace our supply base up to 84%, consisting of 1,161 mills. We believe a lot more can be achieved when we work together, leveraging and building on strategic partnerships towards a common goal. The next In-Cosmetics will be held next April in Paris. We certainly look forward to sharing more new developments and products there! This site provides latest research news and views on tocotrienols and is for research and educational purposes. This site is not intended for the self-diagnosis of any disease or medical condition or the recommendation of any treatment. Readers should always consult their doctors before taking any action for any medical condition, including the consumption of tocotrienols. This site is owned by KLK OLEO. The materials in this site are provided "as is" and without warranties of any kind either expressed or implied. To the fullest extent permissible pursuant to applicable law, KLK OLEO disclaims all warranties, express or implied, including, but not limited to, implied warranties or merchantability and fitness for a particular purpose. KLK OLEO does not warrant that the functions contained in the materials will be uninterrupted or error-free, that defects will be corrected, or that this site or the server that makes it available are free from viruses or other harmful components. KLK OLEO does not warrant or make any representations regarding the use or the results of the use of the materials in this site in terms of their correctness, accuracy, reliability, or otherwise. This disclaimer of liability applies to any damages or injury caused by any failure of performance, error, omission, interruption, deletion, defect, delay in operation or transmission, computer virus, communication line failure, theft or destruction or unauthorised access to, alteration of or use of record, whether for breach of contract, tortious behaviour, negligence or under any other cause of action. All users specifically acknowledge that KLK OLEO is not liable for defamatory, offensive or illegal conduct of other users or Third Parties and that the risk of injury from the foregoing rests entirely with the users. DavosLife is a trademark of KLK OLEO. This agreement shall be governed by and construed in accordance with the laws of Malaysia, without giving effect to any principles of conflicts of law. If any provision of this agreement shall be unlawful, void, or for any reason unenforceable, then that provision shall be deemed severable from this agreement and shall not affect the validity and enforceability of any remaining provisions. This is the entire agreement between the parties relating to the subject matter herein and shall not be modified except in writing, signed by both parties.